As his family recalls, Joe Ronan of West Haven, Connecticut, was always fascinated by firefighting—when he was a preschooler, he loved to watch Rescue 911 faithfully. He was born deaf—he has Waardenburg Syndrome, a fairly rare congenital condition (but most everybody in the Deaf community knows someone with WS). His family realized that he was deaf when he was 8 months old. They are now proud of him. Deaf and hard-of-hearing firefighters are a rare breed. In Connecticut, there are restrictions on what sort of work they are allowed to do. He began his education in public schools, but transferred to the American School for the Deaf in West Hartford. After graduating, he enrolled at Gateway Community College, but couldn't decide between political science, robotics, or engineering. He began attending meetings at the North End Hose Company 3 fire station on Spring Street in West Haven, and found his passion. With interpreters from the Bureau of Rehabilitation Services, he learned what fire crews did, and how to become a volunteer firefighter. Then he began taking classes at the Valley Fire Chiefs Regional Fire School Firefighter 1 training program. His classmates were supportive, and in fire situations, they used tactile signals they'd devised to enable him to keep up with them—a tap on the right leg meant to turn right, a tap on a ladder meant he was to pick it up. He was committed, dedicated, and did his work on his own, though. He works within certain restrictions. 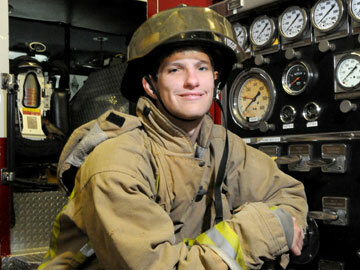 Although he graduated from the fire school, earning a certificate of completion, he can't obtain state firefighter's certification, which would enable him to be a paid crew member, so he's a volunteer firefighter, assisting with hazmat, hose hookup, car crashes, brush fires, administering first aid, and other absolutely vital exterior tasks.